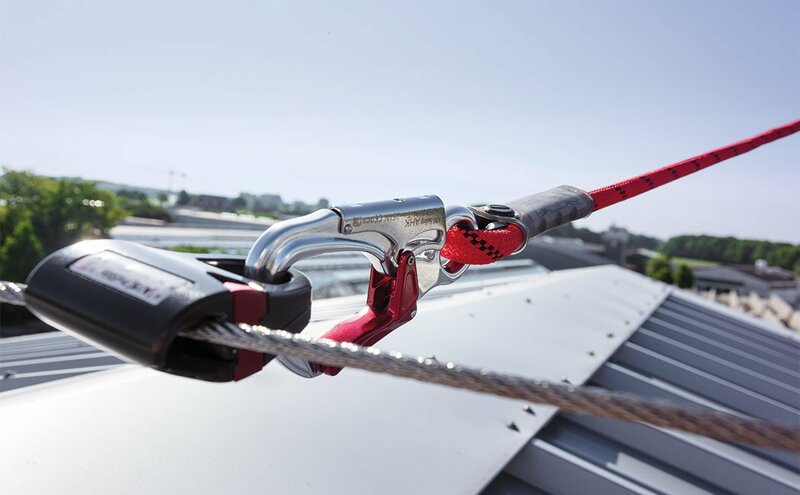 A lifeline system is a fall arrest system consisting of a flexible stainless steel cable strung between at least two points - either vertically (vertical lifeline system) or horizontally (horizontal lifeline system). Vertical lifeline systems generally provide climbing protection and are often installed alongside ladders. These systems are tested in accordance with EN 353-1 "Personal protective equipment against falls from a height - Part 1: Guided type fall arresters including a rigid anchor line". A horizontal lifeline system includes end brackets, tensioning elements and intermediate supports, whereby these supports are often installed at the corners - leading the cable across a range of different angles. Horizontal lifeline systems are tested and certified in accordance with EN 795. Ideally, a lifeline system should be fully traversable; this allows the use of a special glider which can glide right over the intermediate supports. As a result, the worker no longer has to attach back up after passing each support but can remain secured throughout. Another advantage of a horizontal lifeline system is that it can also be installed overhead. This generally offers a greater degree of safety as an overhead system significantly reduces the potential fall distance - assuming that the system is used correctly.